BAPTISM: 1 MAR 1842, Socorro, San Miguel del Socorro Church, New Mexico. 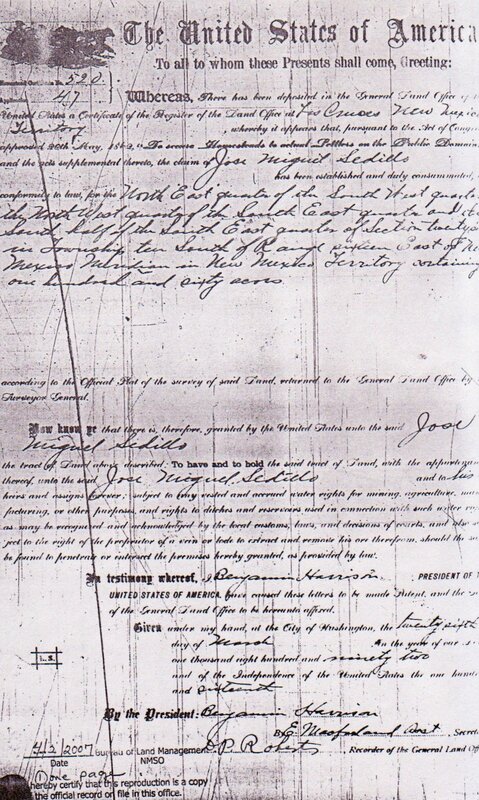 Today the 8 of April 1860, Jose Migues Sedillo, son of Blas Sedillo and Petra Sanchez, married Maria Ines Garsia, duaghter of Pedro Garsia and maria Lucero, residents of Las Cruces, witnesses, Dionicio Silva, Francisco Antonio Silva and Manuel Luna. Signed by Manuel Chavez Presbiteon. Marriages January 7, 1883. In this jurisdiction of El Rio Bonito, I married and veiled Miguel Sedillo husband of the late Ines Garcia, with Ramona Sanchez, single natural of Refugio Sanchez. Witnesses, Juan Trujillo and Tranquilino Montoya. For some space Lincoln County had no sheriff. Few were bold enough to attempt the duties of the office. At length, George W. Peppin consented to receive a temporary appointment. He appointed, in his turn, a score of deputies, and during his tenure of office, robbery, murder, arson, and every crime in the calendar united and held high carnival in their midst. The Kid was not idle. Wherever a bold heart, cool judgment, skillful hand, or reckless spirit was required in the interests of his faction, the Kid was in the van. San Patrick), a small Mexican plaza on the Rio Ruidoso, some seven miles from Lincoln by a trail across the mountain, was a favorite resort for the Kid and his band. Most of the Mexicans there were friendly to him, and kept him well informed as to any movement which might jeopardize his liberty. 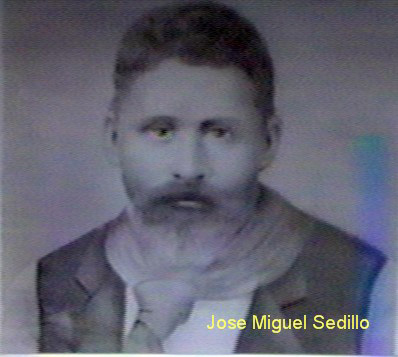 Jose Miguel Sedillo, a faithful ally of the Kid, brought him information, one day in June about daylight, that Jesse Evans with a party from below were prowling about, probably with the intention of stealing a bunch of horses belonging to Chisum and McSween, and which were in charge of the Kid and party. Without waiting for breakfast, the Kid started with five men, all who were with him at that time. They were Charley Bowdre, Henry Brown, J. G. Skurlock, John Middleton, and Tom O. Foliard. This latter was a young Texan, bold and unscrupulous, who followed the fortunes of the Kid from the day they first met, literally to the death. At this time he had only been with the gang a few days. "How are you, Jess?" answered the Kid. "It's a long time since we met. Come over to Miguel Sedillo's and take breakfast with me; I've been wanting to have a talk withyou for a long time, but I'm powerful hungry."